A piece of the roof flew into the street and fatally struck Captain Michael Fahy, officials said. 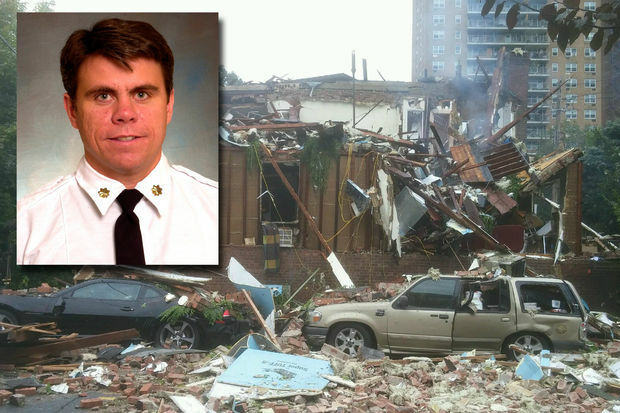 THE BRONX — An FDNY chief considered a rising star in the department was killed and 14 first responders were injured when a marijuana grow house in a Kingsbridge home exploded Tuesday morning, officials and sources said. Firefighters were checking a report of a gas leak — allegedly caused by tenants stealing gas for their pot house — at 304 W. 234 St., near Tibbett Avenue, at about 6:22 a.m. when they discovered what appeared to be a hydroponic marijuana growing lab with propane tanks, sources said. Firefighters, Con Ed workers, and Emergency Services Unit police officers shut off the building's main gas feeder line and evacuated the building and others nearby after finding that the second-floor apartment was tightly locked, virtually sealed with plastic and there was a blue, 55-gallon drum filled with fertilizer on the landing and several more in the basement, sources said. Emergency responders led by Battalion Chief Michael Fahy were in the street overseeing the operation when the building exploded about an hour later, according to FDNY Commissioner Daniel Nigro. Investigators believe a large amount of the volatile gas had collected inside the building, and suddenly ignited. "It was very loud. It just lasted for a real-quick second. I didn't know what it was. I thought a truck slammed into something. Everybody started running. Windows shook. I got really scared," said neighbor Maureen Murphy, 45. Fahy, chief of the 19th battalion, was struck in the head and body with large pieces of the the roof, Nigro said. Several ESU officers, one a highly skilled emergency technicians, desperately tried to save him. Fahy, a 17-year veteran whose father was also an FDNY battalion chief, was pronounced dead a short time later at New York-Presbyterian/The Allen Hospital, officials said. "It's a sad day. Thankfully, this doesn't happen every day, but when it does, it doesn't make it any easier. That's all I can say. We lost a hero today and our members are saddened," said Nigro who was visibly shaken and knew Fahy's father. "He was on the rise. He was a star. He was a brave man," Nigro said of Fahy, a father of two boys and a girl, 6, 8 and 11, respectively. Nine firefighters, six police officers, three Con Edison workers and two civilians were also injured, Nigro said. The severity of those injuries wasn't immediately clear. when it exploded, 3 blocks away me and my son were in my apartment and the entire building shook. Investigators with the NYPD's Arson and Explosion Squad along with Bronx detectives were still trying to determine what sparked the explosion, said NYPD Commissioner James O'Neill. A man believed to be the apartment's tenant was seen outside the building before the blast, but disappeared in the chaos and confusion, source said. The sources say although the apartment was rented, investigators were told no one lived in, or stayed, there. Investigators believe that the operators of the marijuana grow house illegally tapped into the buildings gas line to avoid running up large gas bills beyond that of a normal household, and trigger suspicions. "It would have tipped off someone that there was something going on there," a source explained. The building's owner also has another house on Tibbetts Avenue, but he apparently only rents out space in the building that blew up, sources said. Because his rent was paid on time, he had no reason to check up on his tenant, sources said. In addition to finding the fertilizer drum on the second floor, investigators also found three more 55-gallon drums in the basement. Police had been investigating a tip that there was a drug operation on that block since last week, NYPD Commissioner O'Neill said. It wasn't immediately clear how many people were evacuated from the building or who the lab belonged to. Investigators were still trying to track down all the people who lived in the building at the time, O'Neill said. "There are renters in the house. We're just looking to determine who they are right now," O'Neill said. Roughly 106 firefighters responded to the scene after the explosion, officials said. The Red Cross planned to help those displaced by the blast, they said. #RedCross en route to provide assistance following incident on 234 St in the #Bronx.